This seemed a fair assessment of the situation. All the PNM can do at this time is to put its best foot forward and hope for the best. At present, the PNM controls nine of the 14 local bodies, a condition that will cease to exist after the tremendous surge of popularity of the People’s Partnership (PP). Already the desertion among its troops has began. Diptee Ramnath, the lone PNM member of the Penal/Debe Regional Corporation, resigned from his party and joined the UNC on the grounds that PNM had not delivered the goods and services that his constituents required. In fact, Ramdath sees the PP as the party of the future in which he can find refuge. Although this is a sign of cutting and running, it is a bit premature to announce the death of the PNM. I, for one, was gratified when I saw the attendance at the PNM’s General Council meeting on Monday last. Balisier House was full and the general mood was upbeat. Most of the members seem to understand that they had lost the battle but the larger war of political survival had just begun. Rowley knows only too well the excitement that came over the British people when it placed the Conservatives-Liberal Democratic coalition into power. After two months in office reality struck when the coalition government presented its budget. The result: the biggest budget squeeze in 50 years that hit the poorest in the society. BBC News announced that the UK faces the “longest, deepest, sustained period of cuts to public service spending since World War II.” VAT rose from 17.5 to 20 per cent and all public sector workers making more than 21,000 pounds will have to endure a two-year pay freeze. Even the Queen’s annual payment was frozen. Mark Serwotka, general secretary of the Public and Commercial Services Union, said the budget attacked “the low-paid, the unemployed, pensioners, the welfare state and the public sector as a whole.” David Cameron acknowledged that his budget would change “the way of life” of British people. I am not sure that a similar fate awaits the people of T&T. I only know that there is a financial deficit of $7.7 billion for the fiscal year 2009-10 that has to be financed in one way or another. Our situation may not be as dire as Britain but we will wait to see how our present government deals with our deficit and point the way forward. It may not have to take the drastic measure that British Chancellor George Osborne made but it would not be as easy to fulfil the promises that PP made to its followers. Many may have seen the calling of local government elections before the announcement of the budget as a master stroke which will result in a severe trouncing of the PNM. But, then, one awaits the outcry on the morning after the first budget is read. Only then we will be able to access Kamla’s astuteness and the genuine popularity of the PP; only then and only then we will know how user-friendly the PP really is. It is only then we will see why the PNM must organise itself to be a government in waiting. The Prime Minister and the Minister of Finance, respectively the leader of the UNC and of the COP have made errors which are both amateurish and portend challenges for Afro-Trinbagonians ahead. For Mr. Dookeran, the individual who even more than Jack Warner was responsible for so many young, professional Afro Trinbagonians supporting the PP, his unprofessional comments about the Treasury being empty means that he has not yet begun to govern but is still electioneering. The second, and even more grave error was her immediate meeting with the Prime Minister Jagdeo of Guyana, a country in which according to the 2010 PER Human Rights report from the United Nations, specifically citing grave concerns from the US and from Britain on the systemic marginalisation of minorities in Guyana (a shadow police squad killed more than 200 black youth among other actions) does not portend well for T&T. Ms. Bisessar, given the vast mandate on confidence by the many racial groups in T&T has a unique opportunity to vault T&T politics above the maw of tribalist citizenry. Were she to do so, and to furthermore govern with the measure for good governance laid down by the first and most iconic Prime Minister, Dr. Eric Williams of “morality in public affairs”, she, too would be another and the second iconic Prime Minister of a country that is nothing short of a Paradise, especially compared with the political conflicts and civil unrests and the like so prevalent elsewhere. For Afro-Trinbagonians, however, while the issues now and in the past emanate from politically-perceived struggles, for Ms. Bisessar, with the strategic impact people like Sat Maharaj have on the UNC, the question is whether or not what should naturally be political might unfortunately, and even without her wishing it, descend into religious struggles and conflicts. The second, and even more grave error was her immediate meeting with the Prime Minister Jagdeo of Guyana–Vic. Why would it be an error to meet Jagdeo? Guyana is over 83,000 square miles loaded with gold, diamond, bauxite, and quite possibly oil. Jagdeo plans involve hydro-electic power in a few years. Guyana is finally recovering from the Burnham blight. In the next 10 years Guyana will emerge stronger and prosperous. As for accusations of black youths being killed, I want to assure you that a lot of Indian youths are being killed in Guyana also. I think that Trinidad and Guyana will emerge as strong partners for a better Caribbean. Guyana’s connection to Brazil provides Trinidad with a lot of investment opportunities. Khem please…steupsssss. Guyana is saddled in debt and corruption and have a population that are parasites all through the caribbean. Jagdeo was just looking for money or write off as he did get back when Panday was in power. Nothing more, nothing less…. Prime Minister Kamla Persad-Bissessar yesterday wished Opposition Leader Keith Rowley a long stay in his seat as Opposition Leader and enough success to get a second term in that position. THE People’s Partnership Government yesterday kept its campaign promise to place public procurement legislation high on its legislative agenda. OFFICIALS from the Licensing Department yesterday welcomed the announcement by Works and Transport Minister Jack Warner, at Thursday’s weekly post Cabinet briefing, of an overhaul of the department by year end. Why not debate NIS $2000.00, Gov’t pension $1950, others $3000.00 whether ther worked or not. Time to bury William Burnley once and for all. Whilat thia new government continue to call itself “non-racial” the moves so far indicates the opposite. On naming the ministrey of culture, it changed it’s mind non that name because Sat Maharaj asked that it be changed to “Multicultural”; Ramlogan asked for a speedy answer from the Integrity Commission, when he got it he critised it for responding so fast yet taking so long on other matters; almost all of the ministries are “investigating” corrupting crimes committed by the last PNM administration; Ramlogan appears to be taking a “dragging his foot” approach in extradicrting Ish and Steve;the land grabbing issue is being publicsed as nothing but poor black people who want “something for nothinbg” (ala Ramadarsingh); Kamla could not meet with Hillary as her first international act as PM but find time and convenience to get together with Jagdeo; Dookeran (whom a lot of black people has/had respect for) made that dumb remarks about the Treasury being empty only to be corrected on that matter; bringing back Sat Sharma into the govt ministry (a political and tribal move). They are as yet to announce their own plans on how they intend to run the government, which leaves one to wonder where are we going with all this? Works Minister Jack Warner will act as Prime Minister of Trinidad and Tobago from Saturday, July 3rd until next Wednesday while Prime Minister Kamla Persad-Bissessar is in Jamaica to attend the 31st annual CARICOM Heads of Government meeting. The summit is taking place in Montego Bay. The Prime Minister will be accompanied by Press Secretary Gavin Nicholas, Foreign Affairs Minister Suruj Rambachan, Trade Minister Stephen Cadiz, National Security adviser Gary Griffith and technical officials. Trinidad and Tobago is responsible for energy and national security within CARICOM. 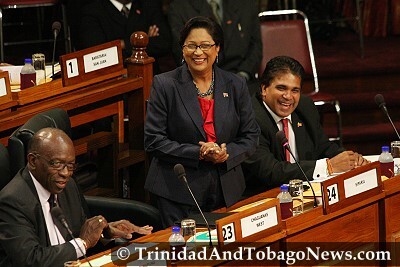 Persad-Bissessar made the appointment Thursday. Warner is the chairman of the United National Congress (UNC), the principal partner in the People’s Partnership coalition. He was the architect of the Movement for Change that forced the UNC to hold internal elections. That propelled Persad-Bissessar into the leadership of the party, and eventually into government.